If you’re like me, you’re just getting your feet wet in the world of medicinal and adaptogenic mushrooms. Until recently, I never would’ve dreamed of putting mushrooms anywhere near my coffee or hot chocolate, but now I’m putting them in my morning lattes, smoothies, evening hot chocolate, and beyond! Let me show you how easy it is to make 2 delicious mushroom “lattes” at home in just 5 minutes. My fascination with mushroom powders began after listening to this Rich Roll podcast episode with Tero Isokauppila, the founder of Four Sigmatic — a company that’s seeking to educate people on the benefits of medicinal mushrooms and make them accessible to consumers. I had no idea mushrooms could be so good for you. From the simple act of eating sautéed mushrooms to adding lion’s mane mushroom to your morning coffee, the health benefits are kind of amazing. I’m certainly no expert, but from what I’ve gathered the best and most accessible mushroom to eat is shiitake (be sure to eat them cooked in a little fat to increase bioavailability). As far as mushroom powders go, I recommend reaching for chaga (for antioxidants, overall wellness, and immunity), reishi (for calm, relaxation, and sleep), lion’s mane (for brain function and focus), and cordyceps (for performance, adaptogenic effects, and increased oxygen flow). So why mushrooms in coffee? Adding things like mushroom powders to coffee can offset some of the downsides of coffee, including jitters, acidity, and disrupted digestion. 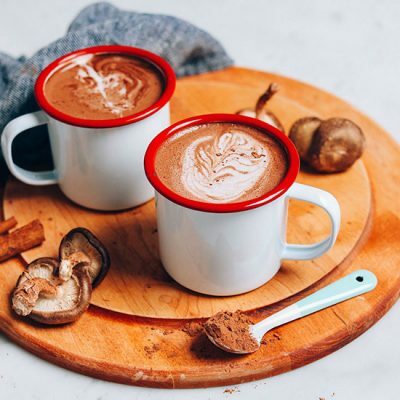 When adding mushrooms to things like hot chocolate, you’re simply reaping the benefits of the various kinds of mushrooms on top of the antioxidants in cacao. And the cool thing is you really can’t taste the mushrooms! Their earthiness pairs nicely with both coffee and chocolate flavors. It’s kind of a win-win. Now, that’s not to say drinking super-sugary lattes or pots of coffee in the morning with a side of mushroom powder makes the health downsides go away. But, there is a lot of evidence to suggest that adding more mushrooms to our diet can be beneficial. With that said, I’ve been playing around with two mushroom blends from Four Sigmatic (not sponsored — just love their stuff!) and have really enjoyed them so far. I can’t say I’ve noticed dramatic effects, but I like knowing that if I am going to have caffeine, the effects won’t be quite as harsh. And if I’m having hot chocolate anyway, might as well enjoy some health benefits while I’m at it. 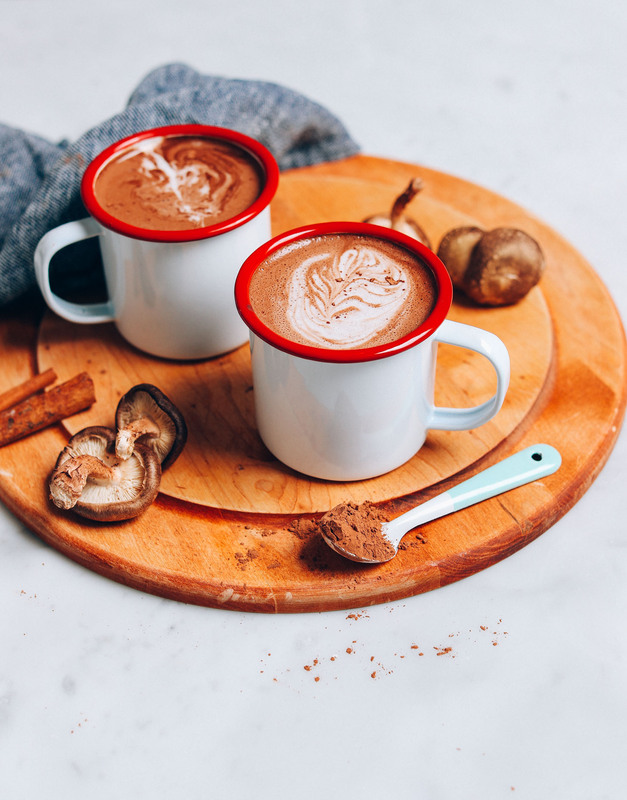 These lattes would make the perfect morning pick-me-up with health perks (especially the coffee version) or evening wind down or afternoon treat (especially the hot chocolate). 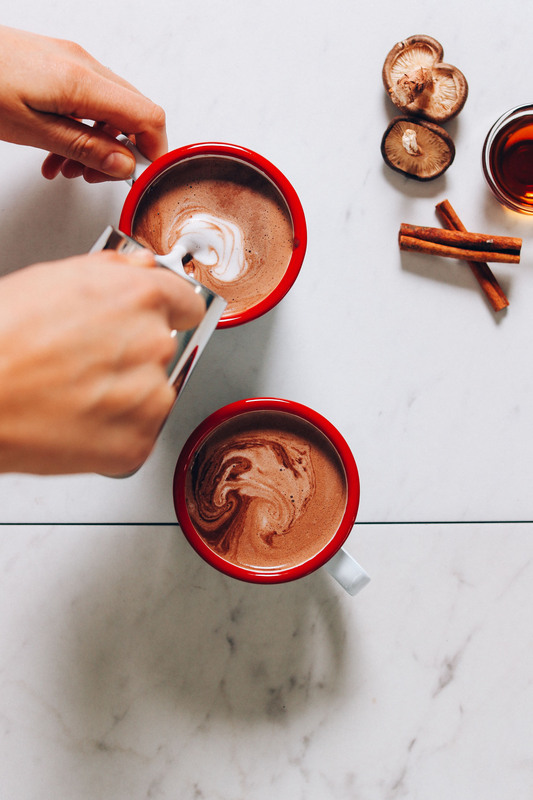 If you’re into cozy drinks, also be sure to check out our 3-Ingredient Healing Turmeric Tonic, Feel Good Hot Chocolate, 5-Minute Vegan Golden Milk, Best Vegan Matcha Latte, and our fan favorite 5-Minute Caffeine-Free Chai Mix! 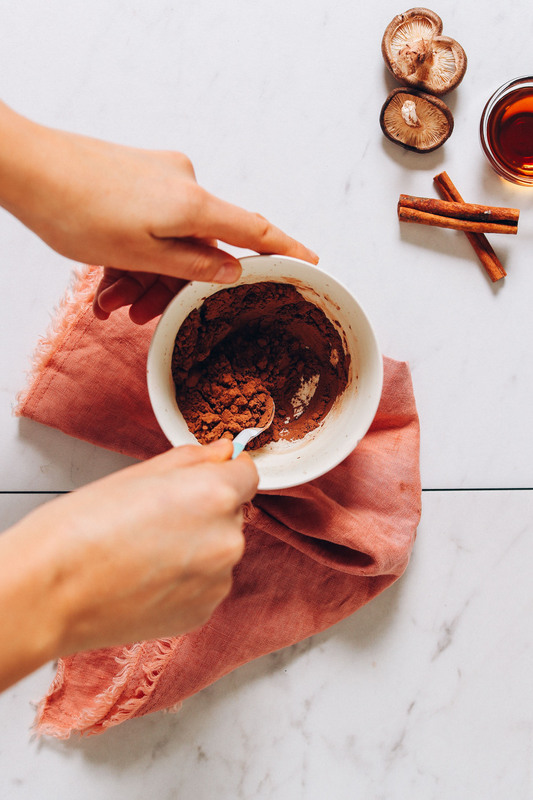 Add mushroom powder, maple syrup, almond butter (optional), cacao powder, cinnamon, and sea salt to a small blender (we like the NutriBullet). Steam or heat dairy-free milk until hot and add to the blender. Blend on high for 30 seconds to 1 minute, or until frothy and well blended. Taste and adjust flavor as needed, adding cinnamon for warmth / spice, more sweetener to taste, or more cacao for rich chocolate flavor. Serve as is, or top with coconut whipped cream, cinnamon, and/or cacao powder. Best when fresh. Store leftovers covered in the refrigerator up to 2 days. Reheat in the microwave or on the stovetop until hot. Add mushroom powder, maple syrup, cacao powder (optional), cinnamon, and sea salt to a small blender (we like the NutriBullet). Steam or heat dairy-free milk until hot and add to the blender along with the espresso or coffee. Blend on high for 30 seconds to 1 minute, or until frothy and well-blended. Taste and adjust flavor as needed, adding cinnamon for warmth / spice, more sweetener to taste, or more coffee or espresso for a stronger coffee flavor. Serve as is, or top with coconut whipped cream or cinnamon. Best when fresh. Store leftovers covered in the refrigerator up to 2 days. Reheat in the microwave or on the stovetop until hot. *The Four Sigmatic blends we love are the Reishi blend and the Superfood 10 Mushroom Blend. 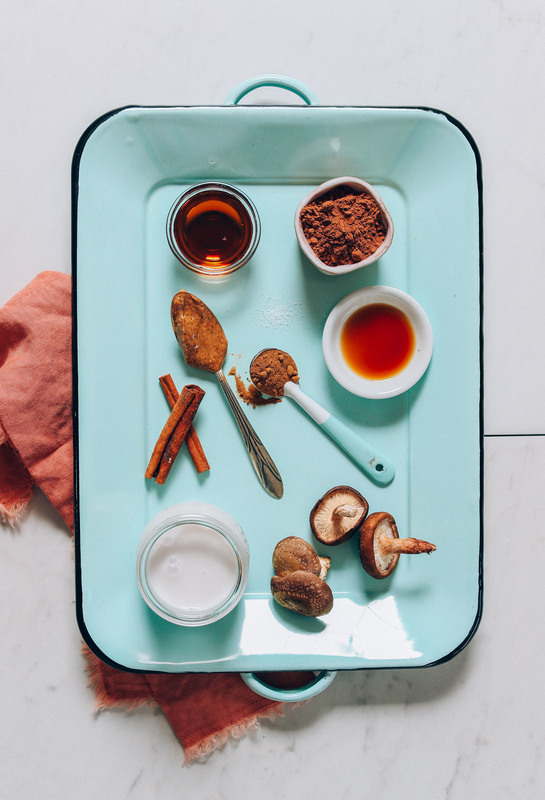 In our experience, the Reishi blend is better for evening time or when you're wanting a calming effect while the 10 Mushroom Blend is more suitable for daytime as it provides a boost of energy. *Nutrition information is a rough estimate for 1 of the hot cacao lattes. The mushroom coffee will be similar in nutrition but will vary based on the ingredients you add. I just ordered some mushroom elixirs! Have just been reading about mushroom & their health benefits. Tapping my fingers & waiting for their arrival. Hi Rita, you can find them on Amazon- 10-Mushroom Blend and Reishi blend. We haven’t seen them in stores, but they might be available in some health foods stores. I had a mix of dried/dehydrated mushrooms at home and I ground them into a powder in my blender and used that for the hot chocolate and it was delicious. Thanks for this tip, Erin! Terrasoul sells Lion’s Mane and Reishi mushroom extract powders that are a steal (I find them on Amazon)! I used to use Four Sigmatic, but they are just TOO expensive, especially when I can make my own. I’m so excited to see people getting into medicinal mushrooms (Lions Mane is a lifesaver for me in grad school! ), but Chaga is so environmentally unsustainable, and I wish its popularity would decline. Most mushrooms can be cultivated, but Chaga can’t – they have to be harvested from the tree, and they take (literally) decades to grow back. Its such an important mushroom for people with very serious illnesses, like cancer, that it seems like a shame to use it for things like the cold (or lotions!) and contribute overharvesting. I just made the hot cacao last night with Reishi powder and OMG it’s incredible! I promptly made one for my husband this morning and he loved it. This is such a lovely thing to start the day with. You’re a rock star! Thank you for this! I love four sigmatic! My husband drinks their chaga everyday and there is a noticeable improvement! He’ll love these! Thanks! Cordyceps may not be vegan, dear friends. Heads up. Yes chaga latta’s are excellent! Thank you for sharing the recipes! Chaga has been claimed to cure H.I.V and Cancer, there is however no scientific evidence that supports this. In the article, it stated that there is’ a lot of evidence’ that more mushrooms are good for you. This is correct but I find it very triggering that the link takes me to a site that makes claims about curing cancer. I which it did. It’s a terrible illness and having a soothing latte might help those battling it, false claims don’t. Please stick to your expertise! your recipes are amazing! Agreed!! All of Four Sigmatic’s health claims are extremely suspect. Unnatural Vegan has a great YouTube video if you want to go more in depth on the actual research that they “cite” (or rather inappropriately overgeneralize/draw exaggerated conclusions from). If you like the taste of mushroom lattes then by all means drink them. But not for the fake “health benefits.” This recipe really made me doubt your critical thinking skills and decreased my trust in your content. You could keep the end of that to yourself in order to keep this a positive place. It is her workplace after all. I find Dana and her crew to be motivated for the good. You have a right to disagree and a right to share it..but just because something is your right, should it always be exercised? Is it helpful? Is it nessecary. You rock, Dana! Have been taking the 10-Mushroom formula for years (sprinkle it on my children’s oatmeal) but never thought to put in my coffee. I LOVE this idea so much! Thank you. Have been making your wellness shots each morning and can’t wait to try this. Love your creativity! Yum! Thanks for sharing your experience, Mary! 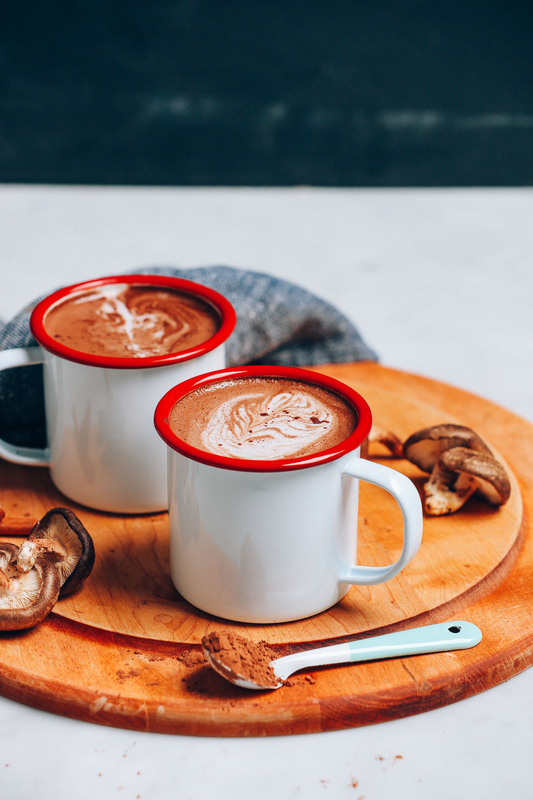 These mushroom lattes look so comforting and warming! Mushroom powder is a superfood I have been toying around with…at least toying around with the idea of purchasing it. Those mushroom coffees are EVERYWHERE on social media! I’d rather purchase bulk mushroom powder and make mushroom lattes all the time though. It seems more practical that way! Good question! We have not tried it and probably wouldn’t recommend doing so. As far as our research goes, companies like Four Sigmatic extract the compounds from the mushrooms rather than just grinding them. Hope that’s helpful! We used the Breville Milk Cafe in the video, but have also had luck with the Nutribullet! Both are great for blending, but the Breville offers the benefit of heating while blending. What kind of little blender are you using – it looks great! Also, what do you use to steam plant-based dairy-free milk? Your website and recipess are fantastic – thanks so much! We used the Breville Milk Cafe. Thanks so much for the information on the Nutribullet. We typically don’t blend incredibly hot liquids in it (which I assume is what led to people having issues), but understand the benefit of being cautious. As for how we steam plant-based milk, we actually own a Lucca A53 Mini espresso machine (which we love). However, the Breville Milk Cafe is an all-in-one blender that froths, heats, and blends so that would be my recommendation. You can find it here in our shop! I always add almond butter to mine. I think I will now get some of their mushroom blend to try in your recipes. Does the powder make the beverage taste like mushroom? I kind of hope it does! Also I’ve heard veggie powders don’t have as much nutrition in them as the real thing. Do you think it’s different for mushrooms? It does not taste like mushrooms! In fact, I find them undetectable. I think in the instance of mushroom powders vs. veggie powders, a whole vegetable is going to be more nutritious primarily for the fiber content. 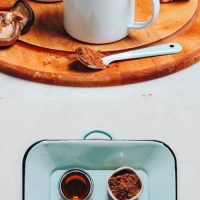 But with mushroom powders, because you’re able to get a more concentrated dose (and Four Sigmatic’s extraction process is very high quality), you may receive more nutritional benefit from the powder vs. fresh mushrooms. Plus, many of the mushroom powders contain mushrooms that are virtually impossible to find fresh. Hope that helps! 1. Where do I get mushroom powder? 2. Which brand blender did you use in the video? It look smaller and more practical than mine! 1. Online mostly! I have only tried Four Sigmatic mushroom powders but am super impressed with them so far. 2. We used the Breville Milk Cafe, but have also had luck with the Nutribullet! Lovely! Would love to see your take on a vegan Aztec mocha. I am genuinely wondering : was this post sponsored by four sigmatic? She says in the post “not sponsored — just love their stuff!”. Thanks for clarifying, Sharon! Cam, this post is 100% NOT sponsored. We just love Four Sigmatic products. We bought the mushroom powders on our own, tested them without their knowledge, and are sharing our honest review here. To find out more about our policy on sponsorships and free products, see our about page! Wow wow wow ! It is in the single digits outside right now and this was the perfect afternoon pick me up ! Thanks Dana !